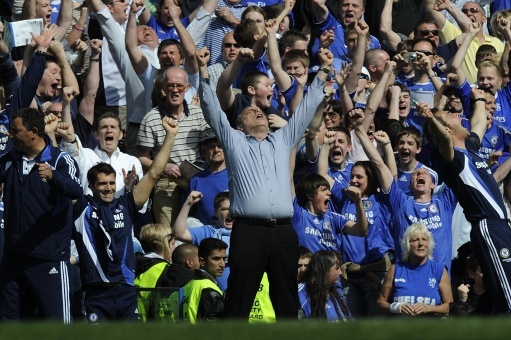 Avram Grant celebrates on the touchline after his Chelsea side beat Man Utd 2-1 at Stamford Bridge, a result that keeps the Premier League title race alive. 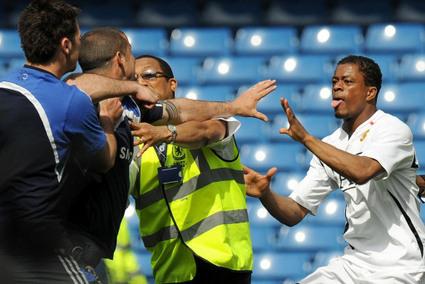 Man Utd defender Patrice Evra scuffles with a Chelsea groundsman after Saturday’s crunch match. The Football Association has requested CCTV footage of the incident. 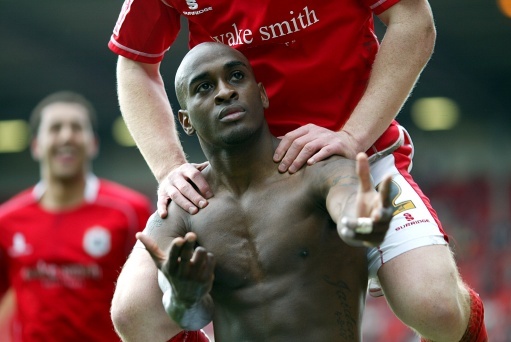 Barnsley’s Jamal Campbell-Ryce celebrates after opening the scoring against Charlton Athletic. Barnsley won 3-0, a result that ensures their survival in the Championship. 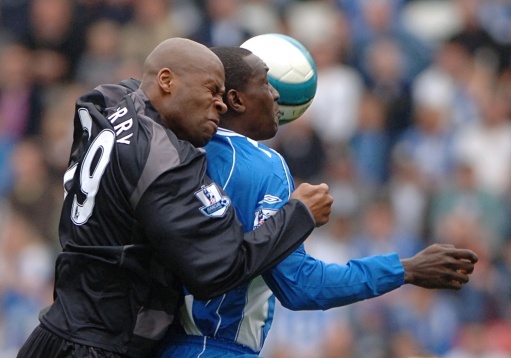 Reading defender Michael Duberry (left) clashes with Wigan forward Emile Heskey. Diomansy Kamara (back to camera) is congratulated by team-mate Paul Konchesky after scoring the winning goal for Fulham at Man City. The relegation-threatened Cottagers had trailed 2-0 but scored three late goals to keep their slim survival hopes alive. 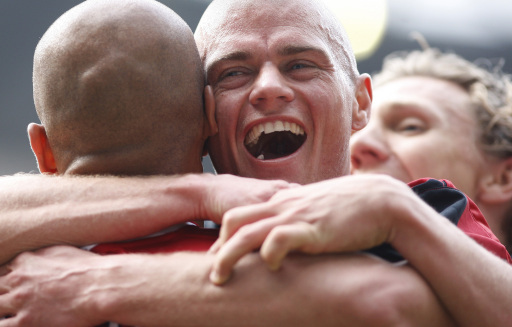 Middlesbrough striker Afonso Alves (on his back) celebrates with team-mates after scoring against Sunderland. 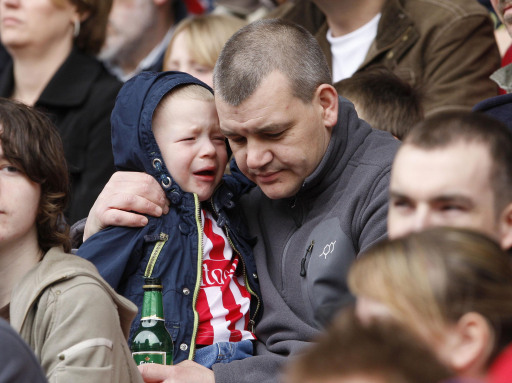 A Stoke City fan and his son react to the news that Hull had scored a late winner at home against Crystal Palace, a result which meant Stoke weren’t automatically promoted from the Championship – at least not yet. Barcelona defender Carles Puyol looks downcast after his team’s 2-0 defeat to Deportivio in the Primera Liga. Barca’s defeat all but guarantees that Real Madrid will win the Spanish championship this season. Madrid will retain its title on Sunday if they defeat Athletic Bilbao at home and second-place Villarreal fails to win at Real Betis. Celtic manager Gordon Strachan and coach Neil Lennon (right) celebrate Celtic’s second goal in the Old Firm derby against Rangers. Celtic won 3-2, to keep the title race alive. Inter Milan defender Marco Materazzi (centre) celebrates with team-mates Nicolas Burdisso (right), and Esteban Cambiasso after scoring during the Serie A match between Inter and Cagliari at the San Siro. Materazzi scored the second goal in Inter’s 2-1 victory. The Milan side remain firm favourites to win the title.